Update: 3/5/2019 - The New Category Hierarchy and our custom Category Selection Tool (part of the MediaWiki Visual Editor) have now been rolled out to Marspedia. Update: 5/7/2018 - This is now officially approved and we will work towards implementing this across Marspedia. Update: 7/24/2018 - all of these categories are now created on Marspedia and we are working to re-categorize all existing content to these. The Editorial Subcommittee examined the current ad hoc approach of categorization of Marspedia articles and found it to be lacking a structure of how information about Mars is displayed and searched. The Subcommittee wanted a logical and navigable hierarchy of categories. This would also form the core of a new Browse experience. The new Marspedia category tree is much more focused on the future and specifically expanded on aspects of the future human exploration and permanent settlement of the Red Planet. It also focuses on outreach (advocacy) and the arts and literature to encourage individuals and the public at large to support human exploration and settlement there. 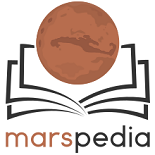 Finally Marspedia is focused on providing the best source of information about past, present, and future exploration and settlement of Mars. These are goals of The Mars Society and that is why The Mars Society sponsors and manages Marspedia. We don’t apologize for the emphasis and focus on the future. That is what energizes the volunteers of The Mars Society and Marspedia. New: The below links use the Category Tree special page to browse these top-level categories. • II. Mars Spacecraft/Robotic Missions - (non-human) - mission planning and execution history. Here is the newest outline format for all categories. This is a work in progress and represents all of the current stuff that was in Frank's original proposed based on MarsPapers as well as what's in Marspedia's Category:Main as modified after Subcommittee meetings of 4/9/18, 4/15/18 and 4/23/18. Current version established by Frank C after 4/23/18 Zoom meeting of the Editorial Subcommittee. Categories were modified after extensive suggestions from Subcommittee members. Version posted 4/15/18 by Frank C after 4/9/18 Zoom meeting of the Editorial Subcommittee. I’ve tried to keep the categories in Title Case, but I added some lower case words in parentheses to make the category more understandable and account for some items that would fall under the category. Exploration categories need work. • No more than 3 levels deep. • Use Title Case for all category names. • Use no more than 1-2 words for category names. Spaces are ok.
• Make Human Exploration a top-level category and further distinguish it from past robotic missions. In this listing of categories, I am trying to develop a logical hierarchy. With a logical hierarchy it will be necessary to use categories with a numbering system instead of the ad hoc alphabetical listing within subcategories. Marspedia focuses on the human journey to Mars that proceeds in definite steps of exploration, documentation of findings, planning for transportation and settlement, settlement, and the ongoing Martian Society, with Outreach (including Marspedia, itself) - a current focus of this effort. I split Main:Concepts into :Exploration Concepts and :Settlement Concepts. I’ll have to divide up the subheadings to Concepts later. There is another Main:Settlements category that should be combined with the new :Settlement Concepts. I moved the Main:Ready for Mars Project to a subcategory under :Missions. I retitled Main:Resources to :Resources for Information to distinguish it from :Insitu Resources which I’ve added as a category to the :Mars Description category. I created a :Literature category under Main:Mars Outreach and put :Science Fiction under it. I created a fifth main category for items that focus on Marspedia itself rather than Mars and I called it Main:Marspedia. Then I moved :Help, and :Questions categories under it. This page was last edited on 5 March 2019, at 01:00.